Any company that is large enough to have IT infrastructure needs the applications delivered from that infrastructure to be always available, even after a disaster. On-premises backup provides strong protection from the most common outages caused by device failure or human error. But local backup cannot help business recover from a disaster without offsite backup, and smaller organisations are less likely to have a second site where they can host IT infrastructure. 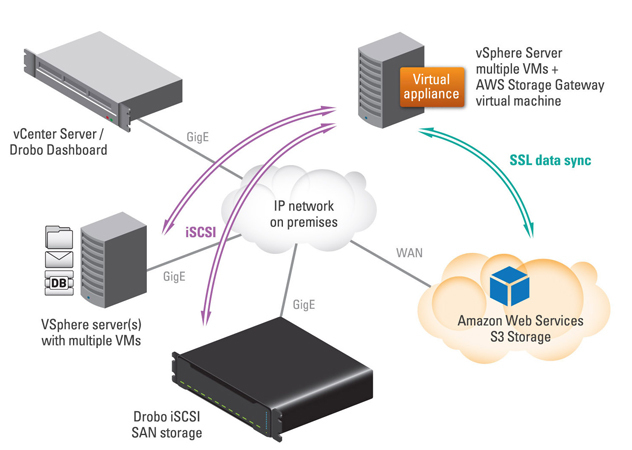 A practical and affordable solution deploys Drobo iSCSI SAN for on-premises backup and leverages AWS Storage Gateway to back up to Amazon S3 (Simple Storage Services). The simple addition of a VM into the existing infrastructure is all that is needed to connect to Amazon S3. Any company that is large enough to have IT infrastructure needs the applications delivered from that infrastructure to be always available, even after a disaster. This is a fact of today's always-on culture. Business needs support from technology, and most companies cannot operate without their applications. Smaller organisations, though, are less likely to have a second site where they can host IT infrastructure. What happens if there is a catastrophe or failure that takes down IT? Without a second site, small businesses are at risk. Local backup provides strong protection from the most common outages caused by device failure or human error. But local backup cannot help business recover from a disaster without offsite backup. Small shops have updated their data protection onsite using disk-based backup, but replacing tape for offsite backup can be costly and complex. Cloud backup is the latest trend, but until recently it has not been a realistic strategy for small organisations. Organisations of all sizes now want to recover applications from the cloud in the event of a disaster. Drobo is the choice for the on-premises storage component of the architecture. For ease of integration, a virtual appliance solution can be used to sync to the cloud for offsite backup. A virtual appliance is a simple virtual machine (VM) added to the existing infrastructure. It maintains the on-premises architecture while enabling an "onramp" to the cloud for selected data. Amazon, the most popular cloud storage service in the world, offers Amazon AWS Storage Gateway, which delivers offsite backup for local Drobo storage to Amazon Simple Storage Service (S3). Another option is to use other Amazon web services with Amazon S3. Amazon provides Route 53 service, which enables updating of DNS so that users are pointed to the instance running in the cloud. It is also possible to create an Amazon Elastic Block Store (EBS) instance from an S3 backup, mount it with an Amazon EC2 instance, and restart the application completely from the cloud. In addition to the benefits of the recovery itself, recovery in the cloud enables disaster recovery testing. Deploy SAN storage device, easy automatic setup with Drobo, configure smart volumes. Download and deploy the .ova AWS Storage Gateway VM. AWS recommends using thick provisioning when installing. Sync time between the AWS Gateway VM with the host on which it is provisioned. Allocate Drobo storage to AWS for storing application data and for working buffer storage. Activate the gateway to associate with Amazon account. Create and mount volumes, snapshots taken based on schedule. Test snapshots and execute recovery plans, you now have offsite backup! Protecting data is important, but cost and complexity prevent small companies and departments from doing offsite backup. Even the lowest-cost iSCSI storage and entry licensing for storage replication are both expensive by most measures, and not possible without a second location for IT. Onsite backup alone cannot provide rapid failover or disaster recovery, but using Drobo for onsite backup and leveraging AWS Storage Gateway to back up to Amazon S3 can now be done affordably. Drobo provides superior data protection with BeyondRAID™ technology in a solution that is very affordable, making it ideal for on-premises data backup You do not need to buy expensive storage with built-in replication for disk backup—it is less complex and costly to use server-based functions for data movement such as AWS Storage Gateway is an example of such. The simple addition of a VM into the existing infrastructure is all that is needed to connect to Amazon S3.